Your action delivers results for workers!! Add your voice to Make Fruit Fair across Europe! In the last newsletter we announced the launch of the Make Fruit Fair! campaign which is mobilising millions of European citizens to take action for fair practices in tropical fruit supply chains. Supermarket chains and a small number of fruit companies dominate the tropical fruit trade across Europe, and abuse their enormous buyer power to push down the prices they pay to suppliers. These pressures are passed on to people at the very beginning of the supply chain. Farmers have no guarantees about the payment they will receive. Workers are often forced to work long hours, for low pay in degrading conditions, exposed to highly toxic agrochemicals that have serious impact on human health, wildlife and the environment. The Make Fruit Fair! campaign is calling on the European Commission to introduce stronger, EU-wide, binding rules that stop unfair trading practices. This will enable small farmers, workers and EU consumers to get a fair deal, that respects human rights while also providing fair prices and enabling sustainable production. You can support the campaign by signing our petition. Please also spread the word, so we collect as many signatures to the petition as possible before we present it to the EC in November. The Make Fruit Fair! 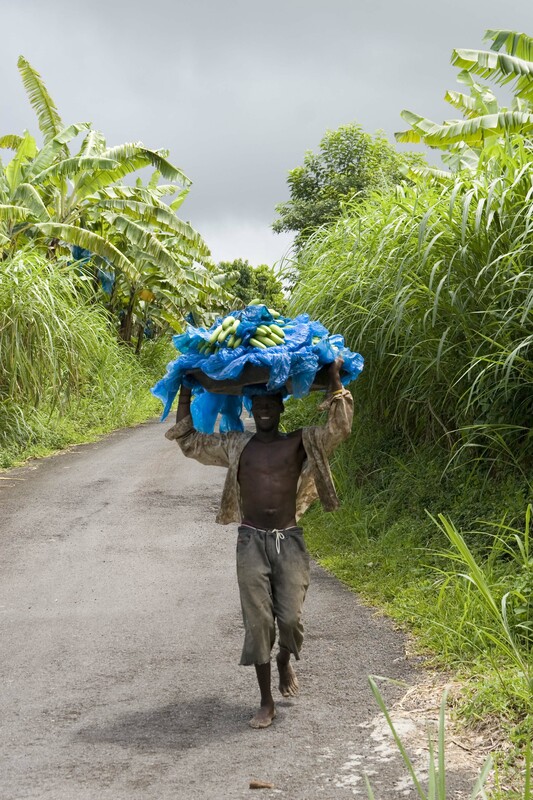 campaign is a global consortium of 19 partners from the EU (including Banana Link in the UK), Cameroon, Colombia, Ecuador and the Windward Islands. SIGN the petition! Together our demand to the EU is Make Fruit Fair – now! Colombia: Collective Bargaining Agreement reached in record time! Representatives of over 18,000 banana workers and 266 growers have successfully concluded a new 2-year Collective Bargaining Agreement in just 19 days! 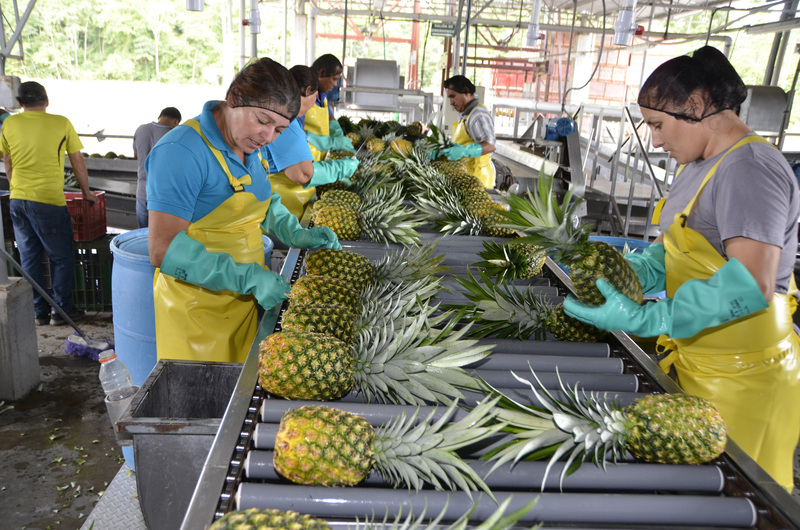 Despite difficult conditions for Colombian fruit in international markets, Latin America's biggest banana workers' union, SINTRAINAGRO, has secured a broad agreement with the industry in Uraba, the country's main exporting region. The agreement includes a 6% wage increase in the first year and a wage increase in line with the Consumer Price Index for year two. A housing fund, jointly managed by the union and the employers, will receive a contribution of 200,000 pesos (29 US dollars) per hectare planted. Two thirds of SINTRAINAGRO members have their own house thanks to these funds and many others have benefited by being able to finance repairs to their existing homes. "This is a model agreement, achieved in a very short time and without recourse to industrial action, which is appreciable given the serious difficulties faced by many workers in the country today", concluded SINTRAINAGRO's President, Guillermo Rivera. Last summer, Banana Link appealed for funding to support SINTRAINAGRO after 750 Columbian banana workers, a disproportionate number of them women, were laid off following hurricane damage last July. Generous donations from Make Fruit Fair! supporters will be enabling the delivery of a programme for rural women workers, including skills training, to increase chances of employment and improve prospects for women. Thank you! The first ever visit by Latin American worker representatives to the islands of the French Caribbean took place in May. 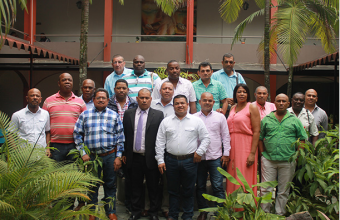 Three trade union leaders from Ecuador, Honduras and Costa Rica, representing Latin American Banana Workers' Union Coordinating Body (COLSIBA), were hosted by workers' representatives of the CGT of Guadeloupe. In meetings with workers from several plantations, the Latin American delegation were able to compare working conditions, hours and occupational health issues. The COLSIBA visitors were especially impressed by the efforts that have been made by growers in Guadeloupe to significantly reduce pesticide use. Aerial spraying stopped last September and now pesticide use, according to research sources, is less than 10% of levels in Costa Rica, for example. The message that bananas can be grown successfully on a commercial scale without nematicides, insecticides, and with low levels of herbicides and fungicides, is a very important one to take back to Latin America, where the real damage to human health from very high levels of toxic chemical use is still largely undocumented. The programme of work on Occupational Health & Safety and pesticide reduction launched during this visit will continue with a series of regional and national workshops in Latin America. Banana Link, who facilitated the visit with CGT, are optimistic that this first step towards closer relations between French Caribbean and Latin American representatives will benefit workers on both sides. DONATE to support Banana Link's continued work to promote cooperation and learning between Southern partners. 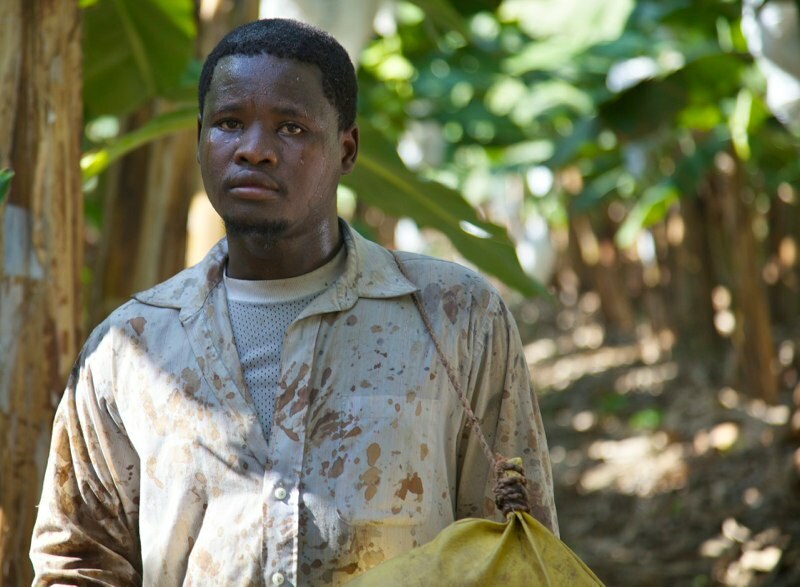 Worker education delivering results in Africa! In March and April, a team of staff from the Fako Agricultural Workers' Union (FAWU), visited 14 banana plantations in South West Cameroon to deliver education to 3500 workers as part of a Banana Link coordinated project to secure Decent Work in the region. The training topics were carefully developed to address common workplace issues including absenteeism, long working hours, and Personal Protective Equipment (PPE). Union representatives took the vital opportunity to hear from workers during their muster, a gathering before the work day begins. FAWU's recent achievements were presented, including improvements towards more reliable transport for workers, and wage increases as part of the newly-revised National Collective Agreement in Agriculture. As a direct result of this training, 264 new members joined FAWU! 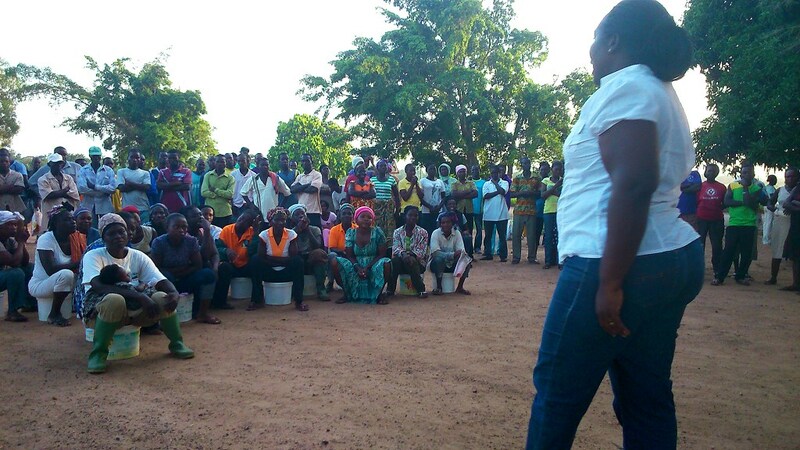 In May, Banana Link sent a trade union educator to Ghana to deliver training to elected representatives of the General Agricultural Workers' Union of Ghana (GAWU) with the aim of developing communication skills and empowering them to educate their fellow workers about rights in the workplace. During the visit, Comfort Ashilley, a union representative who had received education during a previous visit, confidently delivered an inspiring Health and Safety training session to more than 100 workers. The interactive session included body mapping for participants to indicate on drawings where they had pain or injury, and was well received by workers. The effectiveness of education for worker representatives and its trickle-down effect to workers is undeniable! Consumer power - it is in our hands! Ask under what conditions the food was produced - how are workers treated? Buying Fairtrade doesn't always equate to buying fruit produced by small farmers, as there are large Fairtrade certified plantations. If you want to support small farmers, look for bananas produced in the Windward Islands, (Fairtrade bananas are also sourced from small producers in Peru, Ecuador, Dominican Republic, and Colombia). ORDER Support Caribbean Bananas postcards for your event. These can be addressed to the manager of your local supermarket asking that they source Fairtrade bananas grown by small scale family farmers in the Windward Islands. Share this newsletter with family and friends!